Scarborough, in Toronto's East End, has been called "the best ethnic food suburb in the world" by renowned food writer and economist Tyler Cowen. You will find out why during our 3 hour tour as we drive between strip malls and plazas to discover the hidden gems and Mom-and-Pop restaurants keeping their food traditions and culture alive. With well over 200 countries represented in the population, Scarborough is a dream for adventurous and curious eaters! • Tours will include 6 tastings from different restaurants. 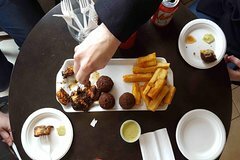 Each one representing a different country or region (Greek Pastries, Tanzanian BBQ, Sri Lankan "Short Eats", Middle Eastern Sweets, Trinidadian Snacks and a seasonal drink) *We reserve the right to adjust our itinerary due to restaurant schedules or other circumstances. Our substitute restaurants will be just as delicious! • Our tour will start and end at the same location. Conveniently located at Kennedy Station on the #2 subway line. • We will be traveling by car or van during this tour. Trips between restaurants are short, on average only about 5 minutes. • We will discuss some of the many ethnic groups that call Scarborough home and what led to their migration as well as the history behind some of their food traditions. • We will be supporting local businesses as all food costs as well as gratuities for restaurant staff are included in your ticket price.